Home » Human Rights & Civil Rights » What Crimes Did Liu Ping Commit? Liu Ping (刘萍) is a laid-off worker and rights activist from Xinyu, Jiangxi Province (江西新余). On April 21, 2013, Li Ping, her local friends and several visitors — about a dozen or so in all — went on the street outside her apartment building and held up posters in support of activists who had been detained for demanding asset declaration by officials and for other actions. They took photos of themselves and then went to dine at a nearby restaurant. Later, they posted the photos on the Internet. On the night of April 27, local police detained Liu Ping and her friends in Xinyu, searched their homes and confiscated their possessions. On April 28, the Xinyu authorities announced criminal detentions for them. This was the “illegal assembly” outside Liu Ping’s apartment building one early evening in April, 2013. Such is China’s judiciary: when they want to detain you, they can do so by finding any fault. Displaying a sign and taking a few pictures will be enough. When they want to charge you, they can bring gratuitous charges against you. Days later, they can change the charges as they please. While seeking to meet with their clients, the six defense lawyers were met with spite, obstruction and physical assault. Earlier in July, without issuing a written announcement, the court notified the lawyers that the Liu Ping and two others will stand trial for “illegal assembly” on July 18. Three days before the scheduled trial, the court notified the lawyers it was cancelled. No reasons given. Such is the manner in which the Chinese judiciary runs itself. The reason it can be so shoddy and careless is because it doesn’t have to be otherwise, and the party uses it anyway it feels like. During the Two Sessions last March, “unidentified people” smashed the windows and the door of Liu Ping’s home. She was threatened and blackmailed over the phone. Local police did not respond to her calls for help. We say they were “unidentified people,” but everybody knows who they were. This all took place because Liu Ping attempted to participate in the election of the local People’s Congress as an independent candidate, and because she has been devoting herself to public interests and to defending rights. This alone is enough to anger the totalitarian apparatus, enough for the regime to persecute citizens. On January 27, 2013, when Liu Ping and 30 or so local friends in Xinyu were having lunch at a restaurant, dozens of policemen in uniforms as well as plain clothes encircled them, seizing their phones and videotaping them. In the police station where they were taken, Liu Ping and friends were stripped twice to be “searched.” In addition to that, they were forced to write a letter of guarantee, promising not to participate in any “illegal meal gatherings” in the future. No policeman showed their badges throughout the process. The scene is reminiscent of the humiliation to which the Nazis subjected the Jewish people. Those of you who wear the national emblem of the People’s Republic of China on your caps and who administer justice in that country, can you please point out where in your law is the prohibition of “illegal meal gathering?” Professor Yu Jianrong (于建嵘) of the Chinese Academy of Social Sciences once asked: Does the PRC Constitution apply to Xinyu, Jiangsu? Then again, Professor Yu knows better than anyone else that the Chinese Constitution applies nowhere in China. During the 18th Congress of the CCP in 2012, Liu Ping and a couple of other activists were kidnapped and held at a secret location, their heads hooded with dark sacks, their hands tied, and their mouths gagged. Liu Ping recounted later, “The walls were patted with sponges and pale yellow synthetic leather dotted with mold. The carpet was filthy with fungi growing in the corners. It smelled foul. A small mattress lying on the floor against the moldy walls served as the bed. The room was about three meters long, and the only spare space where I could walk was a strip along the bed. It was a room within a room. It had no windows. I couldn’t see the sky, nor could I hear anything from outside. I lost track of time. The light was on 24 hours a day, and I was watched by a surveillance camera as well as two men and two women in morning and evening shifts. There were a total of 16 guards who were themselves not allowed to use a cellphone, nor speak to me.” Liu Ping was held there until November 17, 2012. Why did so many innocent citizens have to suffer brutal and unlawful treatment like this when the CCP is having a meeting? This is the police force of the Chinese Communist Party, not the people. No one represents the Party better than they do. During the Two Sessions in March, 2012, Liu Ping, while working in Beijing to support herself, was abducted by six strangers to the former Beijing Office of the Xinyu Steel Company, her employer before she had been laid off. One of her abductors told her, “Let me tell you clearly, Liu Ping, you must go with us today. Our boss said, dealing with you, we are not bound by the law, nor by procedures, and we don’t have to tell you our identities.” Back to Xinyu, she was again detained in a black jail for days, sustaining humiliation and beatings. 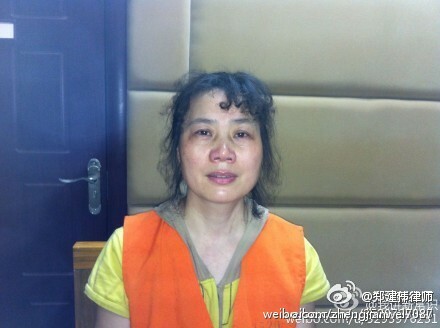 In the year from May 2011 to the spring of 2012, Liu Ping was illegally detained, beaten, and humiliated repeatedly. All of these were the result of one thing: In May 2011 she tried to participate in elections of Yushui District People’s Congress as an independent candidate. Two days before the election, she was secretly detained, and she was released when the elections were over. She was unable to participate in the election after all, but after her bid, she has been met with relentless persecution: A surveillance camera was installed at the door to her home; her nephew was denied entrance into the army for failure to pass the political background check because of her; her daughter was threatened that she would be unable to take the graduate school entrance test. She is unable to be a civil servant, cannot leave the country, and cannot work. Even her mother, who is over 80 years old, is not spared intimidation. Wei Zhongping and Li Sihua, who also attempted to participate in the People’s Congress elections as independent candidates, received the same kind of treatment. They were the other two offenders in the trial of Liu Ping’s “illegal assembly” case. According to the indictment by the Xinyu City Wangcheng Mining Area People’s Procuratorate, “The defendants Liu Ping, Wei Zhongping, and Li Sihua organized an assembly without applying for permission according to the laws and regulations, thus seriously disrupting social order. Their actions violated the 296th clause of the Criminal Law of the People’s Republic of China. The facts of the crime are clear and evidence of the crime is abundant. They should be punished by the law for committing the crime of holding an illegal assembly. Everyone knows that China’s constitution is a knock-off. No, it is not even as good as a knock-off, because a fake LV handbag, inferior as it is, is still a handbag that can hold things and be used as a handbag. The political rights granted to Chinese citizens by the Chinese constitution cannot be exercised in the least. If you do, you commit a crime like Liu Ping and her friends have. What crime did Liu Ping and the others commit? They assembled, they held up signs, and they dined together. For a regime with nerves on edge to stamp out any dissent, these people must be locked up in jail. The trial of Liu Ping, Wei Zhongping and Li Zhihua was not an isolated incident. It is part of the Chinese authorities’ comprehensive crackdown on civic actions such as publicly demanding asset disclosure by officials, same-city dinner gatherings, and any form of spontaneous political expression. In Guangdong, street activist Liu Yuandong (刘远东) has been detained since February when he protested North Korea’s nuclear test with a sign. 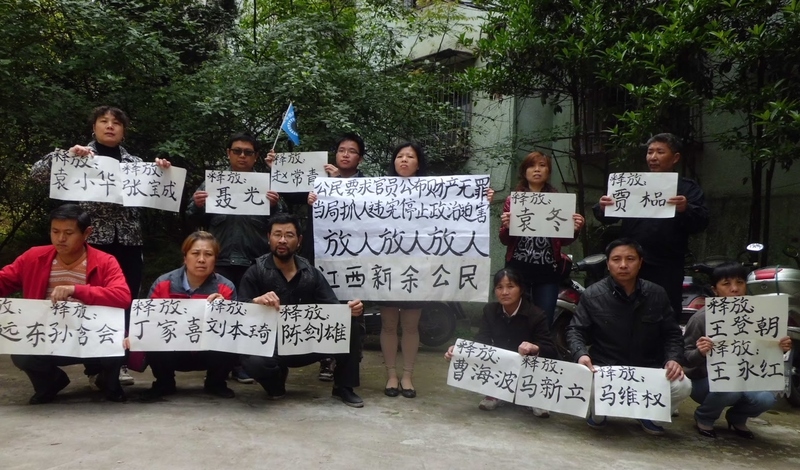 In Chibi, Hubei (湖北赤壁), five activists, including Huang Wenxun (黄文勋), were arrested after displaying signs in the streets. Among them, at least Huang Wenxun was subjected to electric shock and beating. In Beijing, sixteen, including Xu Zhiyong (许志永) the founder of Gongmeng, have been taken into custody since the end of March for displaying signs on the street demanding for assets disclosure by officials. Recently another one was criminally detained. Since Xi Jinping came to office, Chinese authorities have already detained or formally arrested over 100 citizens for exercising their political rights (among them are several awaiting trial on bail), more than the total number during the ten years that Hu Jintao and Wen Jiabao were in power. What is different from the past is that the charge of “inciting subversion” is used less frequently. Instead, they resort to fabricating all sorts of groundless, ludicrous accusations. Guangzhou’s Liu Yuandong was a biologist and a businessman, and the charges against him had to do with finances and taxes. In Hainan, dissident Zheng Youwu and his wife owned a store, and the charge against them is “sale of tainted food.” In Beijing, Qi Yueying was once an eminent domain petitioner, the charge against her was “extortion.” In other cases, where no other charges can be easily trumped up, “provoking disturbances” or “illegal assembly” were doled out. Such is the extent to which a regime flaunts the law and provokes the people without giving a thought. Liu Ping’s trial, if held soon, will mark an important moment in Xi Jinping’s persecution of dissidents and activists since he came to power. If they are able to sentence Liu Ping and the others, then there will be nothing stopping them from trying and sentencing the dozens of citizens currently detained across the country. They will be even more brazen in their suppression of citizens’ basic political rights, so minimally exercised to begin with. Among the signs Liu Ping and her friends held were “Xi Jinping, stop political persecution,” “Xi Jinping, release political prisoners,” and “Xi Jinping, end dictatorship.” Well, the world has learned in a short amount of time not to expect anything like that from Xi Jinping, but the world will be watching closely the trial of Liu Ping, Wei Zhongping, and Li Sihua. By China Change in Human Rights & Civil Rights, Reports, Rule of Law on July 31, 2013 . OT. Would have mailed directly, but have pc issues. Good to see you back on deck. Thank you, @kingtubby1, for coming over here. I miss you folks.